When you look at this photo you can quickly say to yourself, “Dude, that camera looks like it’s going to fall off.” In truth, there is no need to shield your eyes from the horror that you presume may ensue because it surely will not. Rest assured that the camera is securely in place and while it may spin and swing around potentially, it will not fall out and that expensive L glass is safe. 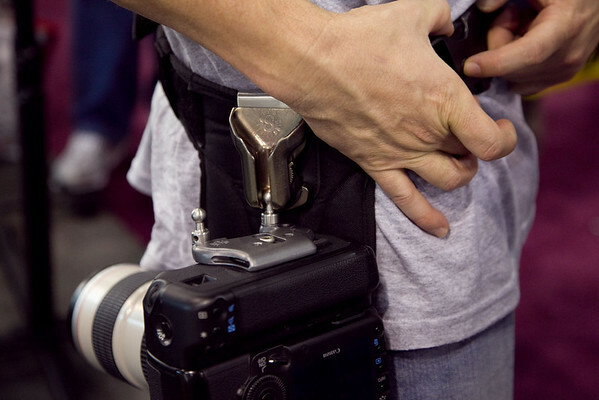 The Spider holster keeps your camera in place via a ball and socket as you see. In the photo above, the ball is mounted on both sides of the plate, easily allowing the users to mount their camera on the left side or right side of their hip. It is always recommended that you keep your camera in this position to facilitate ease of use, speed and a smooth motion to access the camera. Left handed photographers are not at a disadvantage either, which Shai says is one of the major concerns he receives. Now, this isn’t all a one-handed operation. As you can see in the photo, Shai (the creator of the Spider) has his finger on a little latch. When it is all the way down it is unlocked and in order to draw the camera from the holster you need to lift the latch up then pull the camera out. In this position, the latch will return to its downward position. You can then return the camera to its holster this way as well. If you bring the latch up (seen two photos above), the camera is totally locked in position. Sure it will still spin and twirl but it will not come out of the holster. The little knobs with the ball on the ends are adjusted are secured using the supplied Alen key. 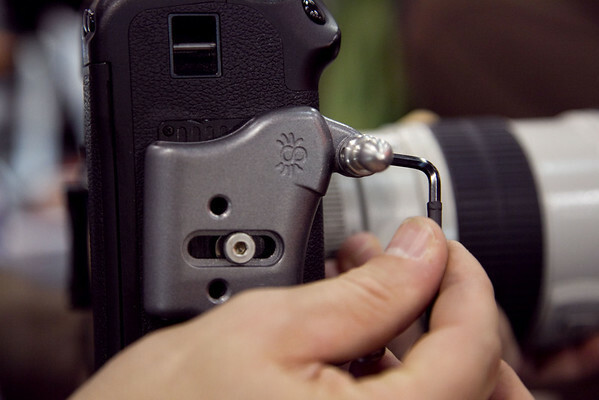 The Alex key is also what ensures that the metal plate secures into the tripod socket of your camera. When you’re done using the Alen key all the user needs to do is place it back into its slot. The Allen key doesn’t seem to come out very easily so you shouldn’t be too scared that such a small but essential tool will get lost. Additionally, the plate can also mount a quick-release plate that works very well with popular tripods. 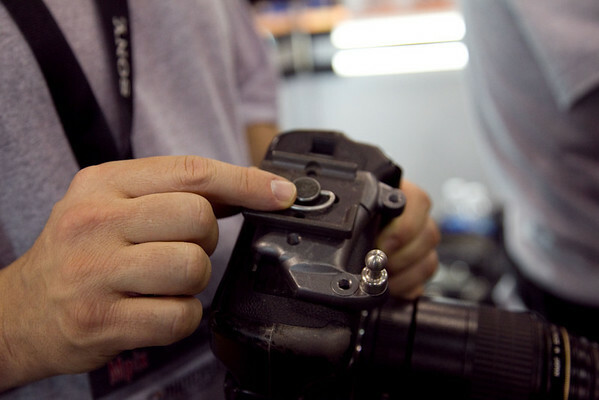 For further ease of use in vertical shooting, the knobs are positioned in such a way that you can put two fingers above the knob to operate your shutter release and shutter dial. It’s up to you to determine whether or not this is comfortable for you. Users with smaller hands may find this a bit of a pain. I asked Shai if the system would work well with a medium format camera like the Phase One 645DF. He couldn’t give me an answer because it hasn’t been tested yet. The reason why I asked is because National Geographic Photographers and some from Magnum Photos shoot with medium formats. In that case, it may be nice to have such a heavy chuck of sensor and glass around your hip instead of around your neck. So will the belt fall off your hips? No, or at least it shouldn’t. It is secured via a large Velcro strap that fits most people. I’ve got a size 30 waist and it was able to go around snugly. Even while jumping and and running around it stayed on. Additionally, the camera would not fall out of its holster. To be fair, I did need to hold the camera in place while running that it didn’t bounce around too much. If you find yourself carrying around more than one body usually, the Spider Holster may be something for you to consider. 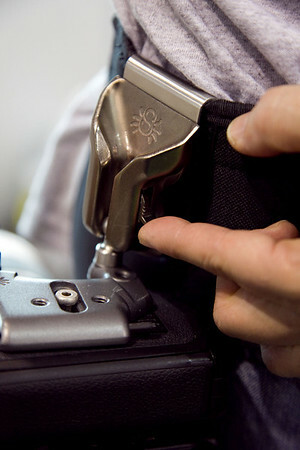 For more info on the Spider Holster, check out spiderholster.com. What happens when you have to put a lens belt from Think Tank or Newswear on top of that for the extra gear some wedding or PJ shooters would want to carry around? Also, it looks like you have to forego the strap – whether the R or neck kind – when shooting. Unsafe. Yeah. That looks like a great way to drop a camera. Or get it stolen while you’re arms are full. And a bit too bulky on the vertical grip. 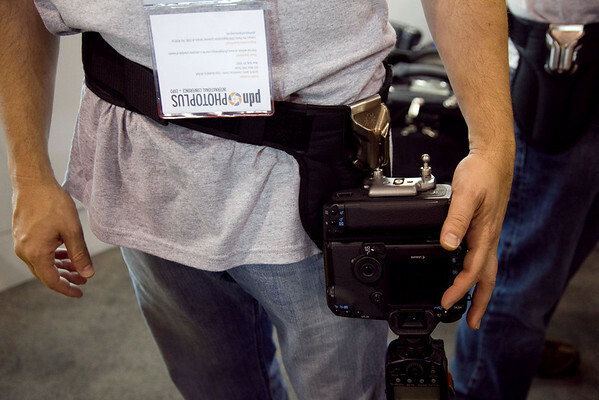 Light compact bodies might be ok–7d/d700 sans grip. 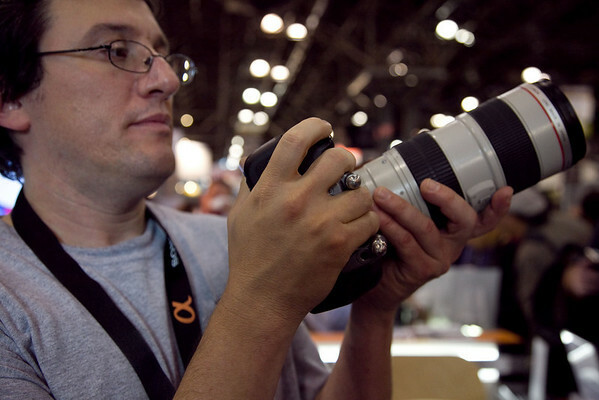 But this scares me for a body with integrated grip and a large lens like a 70-200 or 28-70. And added shoulder strap sounds like a good idea, to combat any slippage down your waist. Micah, Why would the camera be dropped? Get it Stolen? Strange comment, Have you not read the article about the locking mechanism? Seems like a good way of keeping the camera out of the way. This is the hottest thing EVER. 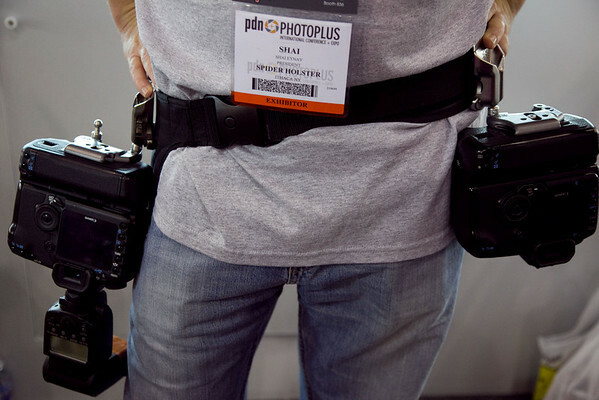 The Spider clip fits well with a conventional belt too, so when I day shoot for fun, I don’t have to wear the Spider belt. Of course, for those of you that are scared, maybe you should keep to the belt with safety lock…. I tried it out at pdn photoplus. 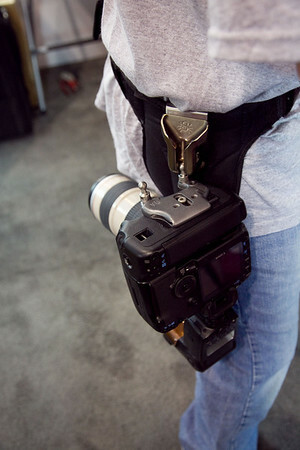 I carry several bodies as a wedding photographer and love my think tank belt. This spider holster is hot. I had the MkII with 70-200 IS on the spider and it hangs natural and comfortable. I am pretty tied to my think tank system but this thing still has me thinking….